This is a two week learning segment on hotspot volcanoes. 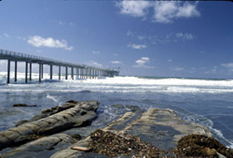 This is a collaborative effort between Melanie McWilliams, a high school Earth and Planetary Science teacher at Chula Vista High School in San Diego, California, and Jamie A. Russell, a masters student at the Scripps Institution of Oceanography, in La Jolla. Utilizing data collected during Jamie’s research, the students were taught about the hotspot theory and how hotspot volcanoes are important to understanding other Earth science concepts. The segment begins with five lessons, one for each day of the week and culminates with a group project for the students. The first week of the hotspot lesson plan is dedicated to providing the students with a understanding of the hotspot theory. The first day is spent learning about relative dating. 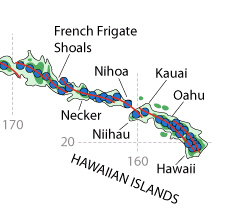 This sets the stage for the students to understand about the different ages of islands within an island chain. The second day students are taught about the hotspot theory, what it is and who came up with it as well as some examples of islands formed by hotspots and how hotspot chains are used to determine absolute plate motions. The third day is dedicated to mantle plumes. Mantle plumes are a suggested mechanism for magma production at hotspots. The fourth day the students learn about Samoa and the presumed Samoan hotspot. The fifth day is a discussion of how scientists conduct research and how Jamie determined the age of the rock samples from Samoa. Each lesson is designed to provide a foundation for understanding the hotspot theory and how hotspot island chains are used to determine absolute plate motions. Each lesson begins with a daily warm-up to get the students thinking about Earth sciences or remembering things from previous lessons. The second week of the hotspot lesson plan constitutes in-class work time only and preparation for a presentation on hotspots using the culminating knowledge gained during the lessons in the first week. 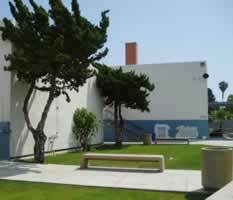 The students form groups and are assigned hotspots or island chains to research. They are asked to present their findings as a PowerPoint presentation. The students are encouraged to use scientific papers to find ages for islands or seamounts within their assigned chains. Other research tools include the previous weeks lesson notes and reliable internet sources. The students at Chula Vista were given three days to work in class to complete their projects and asked to present on the fourth or fifth day. Nearly three months after completing the lesson the students were given a follow up survey to assess their understanding and retention of the material. The results can be viewed in graphical form here. The initial lesson focuses on the concept of relative dating. 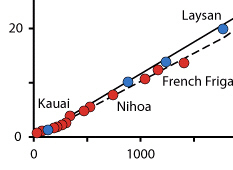 Relative dating of island chains was a fundamental step toward the development of the hotspot theory utilized over 100 years before the hotspot theory was introduced. This lesson introduces the hotspot theory. 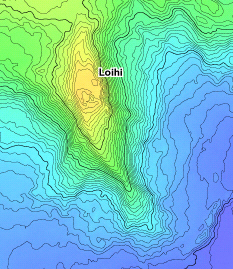 The lesson also discusses the importance of the hotspot theory and how hotspot island and seamount chains can be used to determine absolute plate motion. The final lesson discusses how professors and scientists conduct research from collecting data to presenting the results. The students are instructed to create a 15-slide PowerPoint presentation about a designated hotspot from around the world. There are specific instructions on what each slide should contain, an assignment sheet and an empty sheet to make notes. This is the grading sheet for the final project. Each of the 15 slides should contain a title, bulleted information and an image. This rubric was used by two scientists from the Scripps Institution of Oceanography who were part of the audience when the slide shows were presented. The internet can be used as research tool as long as the students make sure the website is credible. Wikipedia can provide useful information on many of these island chains. If students have access to a library, scientific journals and magazines are extremely useful research tools. Objective: Teach high school students about absolute plate motion, hotspot tracks and hotspot volcanoes by incorporating the use of data sets and up to date science to learn and understand scientific concepts.